TALLAHASSEE, Fla. – The NFL wrapped up its regular season on Sunday, and, as usual, it was a busy week for former Noles across the league. In Tampa Bay, Jameis Winston became the first quarterback in league history to throw for 4,000 yards in his first two seasons. Elsewhere, Telvin Smith and Xavier Rhodes each recorded interceptions while Devonta Freeman and Anquan Boldin both scored touchdowns. NFC: Atlanta (Devonta Freeman), Detroit (Anquan Boldin), New York Giants (Bobby Hart), Green Bay (Letroy Guion). Ravens: DT Timmy Jernigan started and made one tackle. Colts: CB Patrick Robinson (groin) is on injured reserve. Jaguars: LB Telvin Smith started, made nine tackles, grabbed one interception and defended two passes. CB Jalen Ramsey started, made four tackles and defended one pass. WR/KR Rashad Greene (Achilles) is on injured reserve. Patriots: OL Tre’ Jackson (knee) is on injured reserve. Vikings: CB Xavier Rhodes started, made four tackles and had a four-yard interception. Bears: LB Christian Jones played but did not record any statistics. DT Eddie Goldman (ankle) is on injured reserve. Bills: QB EJ Manuel started and completed 9 of 20 passes for 86 yards. TE Nick O’Leary started and had one 14-yard kick return. CB Ronald Darby started and made four tackles. LS Garrison Sanborn handled long-snapping duties. Eagles: LB Nigel Bradham started and made one tackle. S Terrence Brooks made a special-teams tackle. Steelers: LB Lawrence Timmons had six tackles and a QB hurry. LB Vince Williams played but did not record any statistics. RB Karlos Williams is on the practice squad. Browns: OL Cameron Erving started at right tackle. DT Nile Lawrence-Stample(shoulder) is on injured reserve. 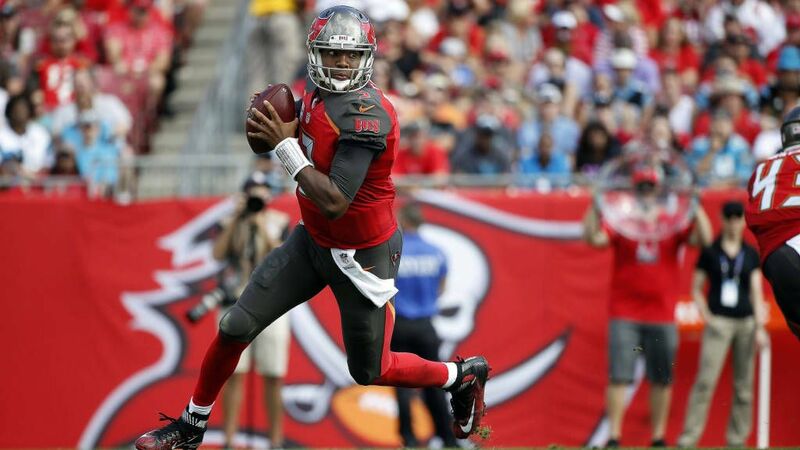 Buccaneers: QB Jameis Winston started and completed 20 of 35 passes for 202 yards, one touchdown and one interception. CB Javien Elliott started, made one tackle and defended a pass. K Roberto Aguayo was 1 for 3 on field goals (make from 33 yards, misses from 46 and 48 yards) and 2 for 2 on extra points. RB Antone Smith (knee) is on injured reserve. Panthers: WR Kelvin Benjamin caught six passes for 93 yards and one touchdown. K Graham Gano was 1 for 4 on field goals (make from 54 yards, misses from 36, 45 and 58 yards) and 1 for 1 on extra points. Falcons: RB Devonta Freeman started and carried 12 times for 96 yards, including a 75-yard touchdown. He also caught five passes 81 yards and a 35-yard touchdown. Saints: CB P.J. Williams (neck) is on injured reserve. Broncos: LB Dekoda Watson had three tackles, a seven-yard sack and a forced fumble. Raiders: C Rodney Hudson and RT Menelik Watson both started up front. Watson made one tackle and recovered a fumble. DE Mario Edwards Jr. made two tackles. K Sebastian Janikowski did not attempt a field goal or extra point. Rams: CB Lamarcus Joyner (ankle) was inactive. Chiefs: LB Terrance Smith started and made one tackle. 49ers: QB Christian Ponder was active but did not play. LB Cornellius Carradine was a healthy scratch. Giants: OT Bobby Hart (forearm) was inactive. Redskins: RB Chris Thompson carried three times for five yards and had six catches for 37 yards. K Dustin Hopkins was 1 for 2 on field goals (make from 32 yards, miss from 57) and 1 for 1 on extra points.